Maybe all you need to know about The Fall is that it’s “presented by” David Fincher and Spike Jonze, two guys who screw with our brains in the name of entertainment. And we love them for it because they expand our ideas about what movies can and should do. 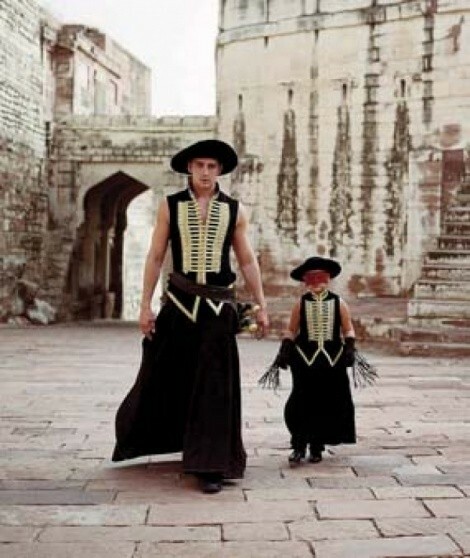 Fincher’s Fight Club and Seven, Jonze’s Being John Malkovich and Adaptation ... and now this one, Tarsem Singh’s The Fall. I’m not even sure now, after many days pondering this extraordinary, bizarre film, whether it even works. But if it doesn’t work, it doesn’t work in a way that other adventurous filmmakers should aspire to. Watching The Fall is a thoroughly unique experience, wildly cinematic in that it never lets you forget you’re watching a movie, and yet so enrapturing that you get lost in it. It’s the kind of experience that only the movies can give you, wherein you willingly suspend your disbelief while at the same time recognize the cognitive dissonance that requires. So you can laugh at it—it is quite absurd in places, though only in the literary sense of the word—and cry with it simultaneously. And there, in how it forces you examine how you digest a movie, is The Fall’s peculiar genius. As much as I despised Singh’s first feature, 1998’s The Cell, I adore this one. The Cell was certainly daring, but it dared in a direction that didn’t seem worth exploring, at least not how Singh did it. He took us into the head of a serial killer, not in an attempt to explicate such madness but, it seemed, to turn madness into something as cool and distant as the cover of a heavy-metal album. Here, though, Singh—who co-wrote the partially improvised script with Dan Gilroy and Nico Soultanakis—explores such intriguing and important concepts as why we tell one another stories and how the imagination of children works. It makes me want to say that The Fall is much lighter than The Cell, except it kinda isn’t. The overall impression isn’t one of darkness, except what’s really going on here is dark, grim and sorta brutal. It’s 1915, and Roy Walker (Lee Pace, who, between this and his recent wonderful turn in Miss Pettigrew Lives for a Day, deserves to be a huge star) is laid up in a Los Angeles hospital, paralyzed from the waist down. He’s a Hollywood stuntman—one of the first, which drags in unspoken themes revolving around the deliberate deception of fiction—and he was injured during a stunt gone wrong. Plus, on top of that, his girl ran off with the movie’s leading man. So he’s pretty depressed—suicidal, even. But he can’t move from his bed, so he enlists another patient, young Alexandria (Catinca Untaru, in an astonishingly natural performance), in a scheme to steal him enough morphine pills so he can kill himself. The child has no idea what’s going on, of course; she just knows that Roy tells the most delightful stories, and that she’d do anything for him so that he’ll keep the tales coming. The Fall is unlike any movie I’ve ever seen before, except that it reminds me, just a bit, of The Princess Bride. The outrageous tropes of adventure stories—pirates, revenge, strange and mysterious characters, unlikely plot twists—get sent up here, too, in the story Roy spins for Alexandria. We see entirely through her child’s perspective, turning Singh’s worldwide locations into primary-colored fantasy lands populated by the familiar faces of the people around her, including her nurses, Roy, and the girl herself—which makes The Fall just a bit Wizard of Oz-ish, too. Even through till the end, the beautiful weirdness of Alexandria’s imaginary Oz—and how she misinterprets things Roy says that seem perfectly plain to us grownups—keeps smacking up against the harsh reality of Roy’s ulterior motives, so that we almost don’t know what we’re “supposed” to feel. And that’s a good thing. For all its patent artificiality, there’s something of the found-object about The Fall, as if it had sprung whole cloth from the forehead of some minor demigod who may be, like Roy is with Alexandria, playing tricks on us, and yet wants to delight us at the same time. And still we don’t care, because the story alone is worth it.